Aim: It is undisputable a fact that a country with a strong system of law and order has a higher GDP and per capita income. The object of this paper is to analyse the impact of legal development on the economic development of India, by contrasting it with a similar analysis of USA. The importance of strengthening our legal institutions is paramount if we want to emerge as a strong global economic power. Institutions have been defined as ‘the rules of the game in society, or more formally, are the humanly devised constraints that human interaction.’ One of the most effective of these rules of interaction is the ‘law’. The relationship between the legal institutions and economic development has interested the academic fraternity for far too long, across the globe. An efficient institutional structure resolves the uncertainties in the market and the problem of asymmetric information and thus, creates a positive exogeneity, ensures the efficient distribution of the resources and makes a positive impact on the functioning of the economy. It further ensures that the economic transactions are done in a cheaper and a safer wat, prevents wastage of resources, contributes in prevention of corruption and ensures transparency and accountability. Hence, it can be said that a strong institutional structure increases the efficiency and quality of trade in a country. Law is specific and compelling in nature, and may cause both, deprive individuals of rights and benefits, and also protect another individual’s rights and freedoms, or economic rights and benefits from unlawful acts. Economy is the main factor that affects the community, either positively or negatively. The close interlinkage between law and economy keeps the States standing, both, nationally and internationally. In India, the lawmakers are gaining increasing consciousness about the importance of rule of law, in order to boost the economic development of the country. While addressing the event at Bihar Chamber of Commerce and Industry, the then Vice President, Shri Hamid Ansari had stated that the rule of law is an essential pre-requisite for economic growth and for drawing foreign investments. However, despite realising the same, the development of the legal institutions in the country are quite at a standstill. The ‘rule of law’ is yet a fancy phrase, and transparency and accountability is a long way off. In this light, this article delves into analysing the impact of developed legal institutions in USA on its economic growth and suggest recommendations that should be applicable in the Indian set up. USA has been considered to be an economic superpower of the world. While, China has been considered a very strong competitor for the top spot, it has been USA that has been making the edge, as yet. A country becomes an economic superpower, based on the perceptions of the other countries around the world, and this perception has recently been collected and analysed by the Pew Research Center. Across 38 nations polled by Pew Research Center, a median of 42% consider the USA to be the world’s leading economy. 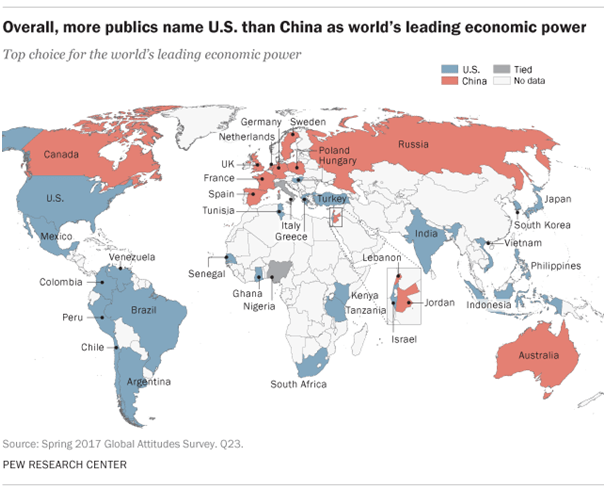 Across all of the countries surveyed in Latin America, as well as most in Asia and sub-Saharan Africa, people tend to view USA as the top economy of the world. The gap between USA and China is narrowing, but that aspect is irrelevant to the theme of this paper. The pictorial representation provides us an estimate of countries which view USA as the economic superpower. The impact and the dominance of the huge economy of USA is so much that a strong US economy has the potential to boost global growths. Further, the quality of economy is complementing the size of it. According to the data from World Bank, the GDP per capita in the US was $53, 042, in 2013; and that of its closest competitor China was only $6,807. Hence, it can be concluded the economic growth of USA, directly influences the lives of the people there. Indians have a significant role to play in the US economy. According to the 2010 United States Census, the Asian Indian population in the US grew from 0.6% of the US population to 0.9%, and with a growth rate of 69.37%, it is one of the fastest growing ethnic groups in US. Indians have been flocking to USA for the better trade opportunities available there and the better standard of living. The factors that have contributed to the growth of trade is USA are several. It includes a wide variety of natural resources that are available in the country, in abundance, which have been aggressively been exploited. The natural resources include, coal, oil, copper, bauxite, lumber, gold, silver, amongst others. Further, the American culture has placed heavy reliance on the entrepreneurship ventures of the people from the very core. The history of USA has also favoured its trade, that is, the last time USA was invaded was in 1812, which is over 200 years ago. This allows for the trade to develop and grow at a constant pace. However, the most important aspect of this trade growth is the legal system of USA. There have always been very few obstacles to trade in USA throughout the history of independent USA, and the US Government has taken active steps to protect the trade, domestically and internationally. Hence, it becomes pertinent to analyse the contribution of legal system in the economic development of the country. The rule of law is an indispensable foundation for a market economy, which provides an essential environment for the creation and preservation of wealth, economic security, and well-being, and the improvement of the quality of life, and does not become a necessity merely for the reasons of them being the fair and the reasonable principles of human conduct. International development organisations and commentators generally agree that a central function of the state is to create and enforce rules which support economic growth. The distinctive rule of law features required for a market economy impact the enactment of laws by the legislature, the resolution of disputes by the judiciary, and the regulation of the economy by the executive branch of the government. Together, the various branches of the government must enact and administer a legal system that provides a structure for efficient economic activity and provides for a speedy resolution of disputes arising out of the controversies, in the economic system. Judiciary has an important role to play in the economic development of USA. The judiciary in USA has been delivering faster dispute resolution, which allows the businesses to be paid faster, clear up the uncertainties regarding liabilities and save further on the economic resources. Despite this, there has been discussion in the USA regarding the deadening effect of litigation on the US economy, which is as small as a miniscule, when compared to the Indian scenario. As an example, we can consider the freedom of speech in USA. The ambits of freedom of speech in USA is far greater than in India, and that has had a significant impact on their economic prosperity. The benefits of free speech have been seen in the field of economy, for most of the trade occurs by means of communication, which helps in both, finding the benefits by the parties and also to avoid costs. The Americans with a comparative liberal free speech regime have a greater tolerance level than citizens of other countries, which is beneficial for their trade and economy. New ideas and innovation are especially necessary for sustaining economic growth and these are fostered by a liberal free speech regime in USA. We have seen that a country’s legal system significantly affects the economic development of that country. India is no exception to it. The Indian legal system has had a consistently negative impact on the economic growth of the country. The huge pendency of cases in courts, strict trade regulations, a protectionist attitude, and the judiciary not analysing or comprehending the economic aspects of their decisions, cause huge impediments to economic growth in India. India has had a very diverse economic trends, within the country itself. The economic growth in India is both, geographically and sectorally, concentrated. The empirical data collected, shows that between 1970 and 2004, the fastest growing states, which were Andhra Pradesh, West Bengal, Karnataka, Gujarat and Maharashtra, grew over twice as fast as the slow growing states. The richest five states received disproportionately high share of capital, of about 55% of the total stock, while the poorest five received only 15%. And half of the total FDI approvals go to the five most prosperous states. The economic growth is also sectorally concentrated in the high skill and service-related industries. Hence, this goes on to show that the legal institutions and the legal policies have a huge impact on economic growth of India. India’s judicial system is infamously slow, even by the standards of a developing country. These slow courts in India substantially affect the output and employment growth in the formal manufacturing sector, negatively, given the fact that certain industries rely on contract enforcement more than others. 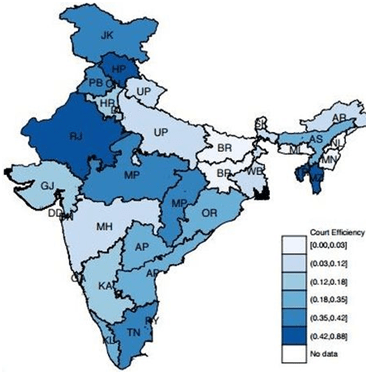 On measuring the efficiency of Courts in terms of fractions of cases resolved in a year, the National Crime Records Bureau came up with a figure of Indian map, displaying such inefficiencies across states, in 1999. Slow courts increase the costs of enforcement of contracts, by delaying the payoff of taking an agent to court. If contracts are costly even to enforce because the cases take years or even decades to resolve, parties might avoid making investments or engaging in potentially surplus making transactions. The specific buyer-supplier relationship transactions have a greater need for reliable contract enforcement, because if one of the parties does not abide by the contractual terms, then the input has no resale value. 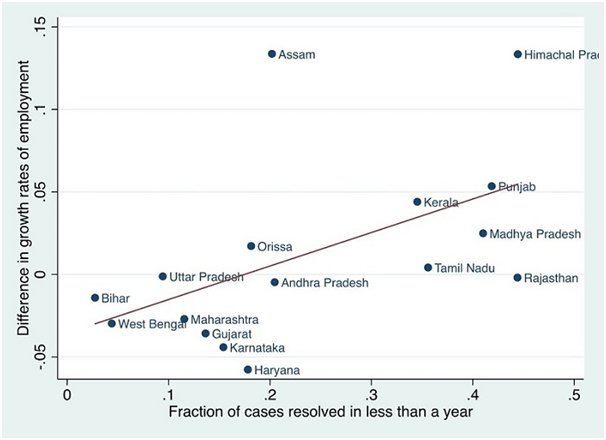 A study done shows that firms in contract-intensive industries should grow faster than those in non-contract-intensive industries, when they are located in states of India with efficient courts, which has been represented by the graph below. The graph represents the difference in average employment growth rates between contract-intensive industries and non-contract-intensive industries (vertical axis) plotted against court efficiency (horizontal axis) for major Indian states. Court efficiency is measured as the fraction of cases that are resolved within one year in district/sessions courts in 1999. Hence, we see that the inefficiency of the courts in India is a major hinderance to the economic growth. Further, the courts also have to ensure that their rulings do not have an adverse impact on the economy of India. The Supreme Court has been interpreting the economic policy matter, but has evidently not been able to keep pace with the changing policy regime, which needs to be taken care on an immediate basis. The protectionist attitude of the legal policy makers is another hinderance to the economic growth. The policy makers tend to over protect the industries in India, from the foreign competitors, which affects the quality of service rendered to the consumers and also the growth of the economy, in a larger sense. Hence, the link between the legal development and the economic development of India is clearly established. There is a pertinent need to address the issues of legal development in the country, for ensuring a sustainable and stronger economic growth of India. Despite the differences in the history and the size of the economy between USA and India, the fact remains that the growth of legal institutions is important in order for the country to grow economically. USA, having realised this fact, has worked upon building a system of efficient courts and a legal environment which fosters trade. India has to take cues from the former and act accordingly. The pendency of cases has been a problem that has plagued the Indian courts for far too long now. It is high time that the policy makers take note of this problem and take active steps for the resolution of the same. The policy makers need to create a trade friendly environment, in order to attract foreign investment to the country. With a huge manpower and very high rates of unemployment, India is direly in need of industries investing in India, for creation of jobs for the people. The economic growth of the country has the potential to address a number of problems for the impoverished masses of India, including hunger, standard of living and increasing crime rates. Ash Ozpolat, Gulsum Gunbala Guven, Ferda Nakipoglu Ozsoy & Ayse Bahar, Does Rule of Law Affect Economic Growth Positively, 7(1) Research in World Economy (2016). Kelsen, H. (1951). The Law of the United Nations: A Critical Analysis of Its Fundamental Problems. Steven and Sons Limited, London, p. 706. Samuel L. Bufford, International Rule of Law and the Market Economy – An Outline, Penn State Law (2006). Amanda J. Perry, The Relationship between Legal Systems and Economic Development: Integrating Economic and Cultural Approaches, 29(2) J. of Law & Society (2002). Randall T. Shepard, The Judiciary’s Role in Economic Prosperity, 44(987) Indiana Law Review (2011). Oliver E. Williamson, Transaction-Cost Economics: The Governance of Contractual Relations, 22(2) Journal of Law & Economics 233 (1979).